Higher pressures and expanded size range to include larger plug sizes and smallest SAE style ZLG Plugs. The Zero-Leak Gold product line of EPCO Products, Inc., a Fort Wayne, IN based company, is a revolutionary line of plugs and fittings. The fittings developed a zero leak seal at lower assembly torque values than their SAE counterparts. 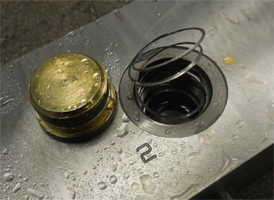 EPCO wanted to determine more accurately the burst pressures of the larger and smaller plug sizes that were not originally included in the earlier Zero-Leak Gold Plug tests conducted by the Fluid Power Institute. EPCO wanted confirmation of these values under accepted industry practices and established measuring methods. Evaluation by the FPI determined the maximum pressure that each specimen could withstand before it would no longer contain the fluid. This defines a failure.